It was a night defined by surprise winners and losers, with predictions for next month’s Oscars ceremony beginning to take shape. After a somewhat tepid critical response, Queen biopic Bohemian Rhapsody reigned victorious above more revered contenders BlacKkKlansman and Black Panther, picking up awards for best drama and best actor. Meanwhile, Glenn Close bagged herself the best drama actress award, ahead of A Star Is Born favourite Lady Gaga, and proceeded to deliver a powerful speech urging women to ‘find personal fulfilment’. Whether you agree with the chosen victors or not, it was an evening which sparkled with Hollywood glamour and wit; where talented Brits such as Olivia Colman and Richard Madden shone brighter than many of their American counterparts. Hosts Sandra Oh and Andy Samberg (‘the only two people left in Hollywood who haven’t gotten in trouble for saying something offensive’) delivered numerous wisecracks, albeit remaining not quite as naughty as previous hosts. And, as has been the case in recent years, there’s been as much drama and debate unfolding on social media as in the Beverly Hilton hotel itself. Shoutout to everyone who is watching commercials for the first time in several months. Many people have called Netflix out on their salty remark, and have thrown some serious shade of their own. All joking aside, Netflix has enjoyed success at the Golden Globe Awards, demonstrating how the quality of their original programming has truly elevated them. Netflix comedy The Kominsky Method won Best Comedy Series, with leading man Michael Douglas also taking home the award for best lead actor in a comedy series. That’s why now you’re seeing situations like The Kominsky Method, a half-hour comedy which can be 25 minutes long or 40 minutes long. You can say anything you want. There are no commercials. It’s as close as you can get to a short film. For me, at this point in my career and at my age, this is fantastic. I love it. 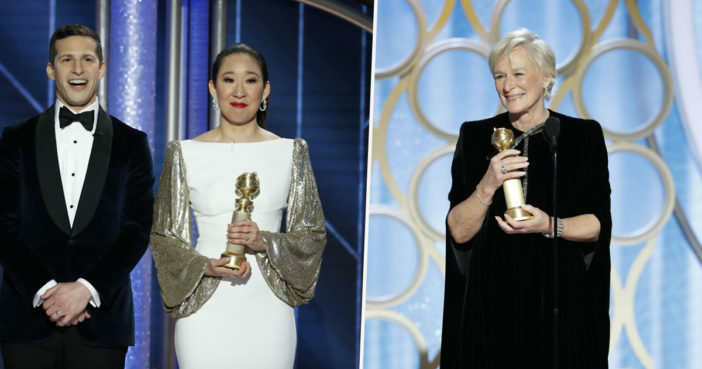 The 76th Golden Globe Awards ceremony was aired Sunday, January 6, 2018.